After weeks of fan speculation about a possible expansion for The Sims 4, players got an answer from its creator today. Yes, the game is getting its first batch of paid DLC soon. But it's not a full "expansion" like the ones previous Sims games received. Rather, it's a "Game Pack," and it sounds sort of fishy. So, what can you expect from the first Game Pack in early 2015? Well, you're going to take your Sims to Granite Falls to visit and explore an all-new destination. The woods are packed with gameplay possibilities. Campfire songs, weenie roasts and bear costumes, oh my! Kotaku: You mention that that the game pack will add "new gameplay features" into the mix, but it sounds like most of the additions specified are specific assets/bits of content—outdoor cooking and costumes. Are you adding new activities that Sims can participate in as well? EA: Yes, we have some really great new things for Sims to do. Sims can partake in new group activities like the campfire and horseshoes, try their hand at mastering potions with the new herbalism skill, wander through the wilderness, collect all new plants, insects and use them to create herbal remedies and new cooking recipes. Kotaku: What sort of destination/area is granite falls, exactly? is it a new public lot? will sims be able to set up houses there, or anything like that? can you build buildings there, regardless of what sims (if any) live there, or is it more wilderness focused? will you be able to mess around with any of the geographic features in build mode at all? EA: Granite Falls is a brand new destination in The Sims 4. When you arrive you'll be in a Campground neighborhood where your Sims can set-up camp among the trees or rent a fully furnished cabin. Your Sims will only have what they bring with them – any additional supplies they'll need they'll have to purchase at the Ranger Station – but players may edit the Campground lots through Manage Worlds and build whatever they like on them. Ok, so the extra activities sound like fun. I bet those "herbal remedies" will add some opportunities to mess with your Sims. Who knows, maybe you'll even be able to poison them. Accidentally, of course. Also, two new areas sounds like an exciting addition—though I'm not sure how they'll fit into the existing neighborhood and lot structure, exactly. Regardless, Granite Falls and the national park sound like a nice way to add an extra dash of variety to the two main worlds that are currently in The Sims 4. While both look great and have plenty of fun things to do within, I and many other Sims fans have definitely started to feel a tad...bored with the game's current offerings. All of this sounds good, then. So what's the problem? Well, the one part that weirds me out about The Sims 4's "Game Pack" announcement is how and why the game's developer is shifting away from creating proper "expansions," which have been a fan-favorite staple of the series for a long time now. This change is particularly surprising to me as a Sims fan because the new game has been mired in a wealth of controversies since before it even came out. As I reported back in October, most of these issues stem from the fact that players and longtime Sims fans feel that The Sims 4 comes up short, content-wise, in comparison to its beloved predecessors. The Sims 4's creators have taken some steps to address fans' criticisms in this regard, such as when they added ghosts, swimming pools, and two extra careers to the game for free. But choosing to forego expansion packs in favor of something that sounds less substantial in comparison sounds to me like the developers are repeating the same mistake that made Sims fans so upset in the first place. I have been working with members of The Sims 4 team on something fun. I am excited to share it with you all, as I know it's going to allow you to tell even more unique and wonderful stories with your Sims. Two words. Game Pack. What is a Game Pack you ask? Game Packs are unique to The Sims 4. 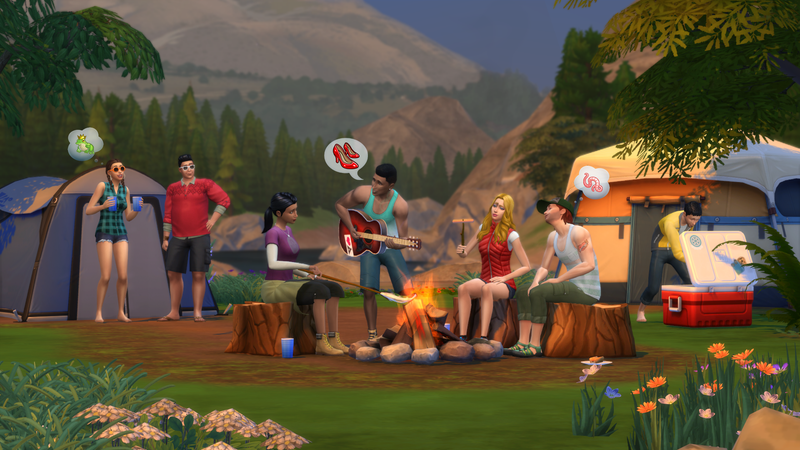 Our first Game Pack - The Sims 4 Outdoor Retreat - will be coming out in January 2015, but before we talk about that, let's talk about what a Game Pack is. For The Sims 4, we wanted to continue that tradition while giving you even MORE opportunities to craft the stories you want, since a Game Pack provides new gameplay features, new objects and new clothing based around one central theme. Being able to expand your gameplay through a Game Pack allows us to give you some of the things you've been asking for and it's something we are really excited about. Kotaku: Previously, I tended to think of The Sims as the kind of series that did post-release expansions and stuff like that. What is the difference between a "game pack" and an "expansion," exactly? EA: A Game Pack is an entirely new product line for The Sims franchise. A Game Pack will allow you to add a uniquely themed experience to your game filled with new gameplay possibilities, introducing something new for you to do with your Sims. Play with new objects that offer all-new interactions and a variety of new clothing, hairstyles, furnishings and décor! For players who are familiar with our add-on content from previous iterations of The Sims: think of The Sims 4 Game Packs as a new product line that seats somewhere between Stuff Packs and Expansions. Kotaku: On a related note, will The Sims 4 get expansions as well in the future, or do you see game packs making up most/all of the post-release stuff? A: We want to provide our players with options and provide as many new gameplay experiences as possible. As The Sims 4 has been created to be a live service, free game updates will continue to release on a timely basis. Additional paid content packs are in pre-production and we'll be sharing those in the future. That doesn't preclude full-blown expansion packs in the future, necessarily. But it definitely sounds like "packs" are the way of the future for The Sims 4. I reached out to EA for further clarification on this point, and will update this story when I hear back.